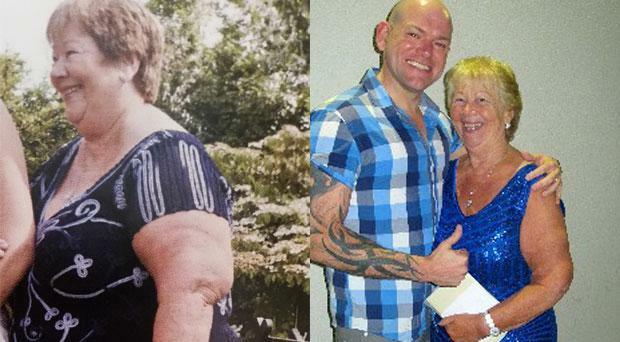 An Irish woman who lost more than five stone in the run-up to her 70th birthday said that her sister's frightening illness gave her motivation to lose the weight once and for all. Grandmother Winnie Murphy (70) was worried that she would end up in the same situation as her elder sister, who was placed on life support while battling an illness last year. "I have a sister who has struggled with weight for a long time, just like me," said Winnie. "She's two years older and last year she was on life support. "It frightened me how ill she was and I couldn't help but thinking she might not be in that situation if weight wasn't a problem. I just wanted to be able to do all the things I love for as long as I could without the weight holding me back." Winnie has dropped from a size 24 to a size 10 since May 2014. "I wanted to be able to walk without huffing and puffing or to climb the stairs without worrying about the struggle. "All the girls in my family were always big. We used to say it was in the family but of course it was all to do with our bad eating habits," she said. "Age is only a number. I didn't want to be spending my old age sitting around in a chair," mum-of-two Winnie added. The granny, originally from Cashel, Co. Tipperary, but now living on the Navan Road in Dublin, threw a huge party to celebrate all her hard work earlier this month. Losing weight has inspired Winnie to do things that she couldn't before. "Last week I got on a bike for the first time in years. I was wobbly and only rode around the house but I did it," she said. Winnie credits her astonishing weight loss to Slimming World, which she joined in May 2014. "I don't deprive myself," she said. "Life's too short to not have a piece of cake at your birthday or an occasion but it's all about balance and keeping on track."